Home » Articles » Why Can't They Just Get Along? Your daughter comes home crying again. The girl drama has reached global proportions. Her former best friend, who has been ignoring your daughter for a week, has now formed an alliance with Popular Girl, the one in the grade both friends used to make fun of because she thinks she’s all that. Now Popular Girl and Ex-Best Friend are whispering in corners, pointing and laughing at your precious daughter. Her world is shattered and she’s barely entered tweendom. As flashbacks from your own elementary school crises flicker through your mind and heart, you ache for the right response. Do you tell your daughter this is just normal girl stuff that she’ll get over? Do you call the school and demand instant peer mediation? What about calling Ex-Best Friend’s mother and becoming her ex-best friend? Actually, as satisfying as those options sound, none of them best supports your daughter in her first struggle with relationships. What do you do? 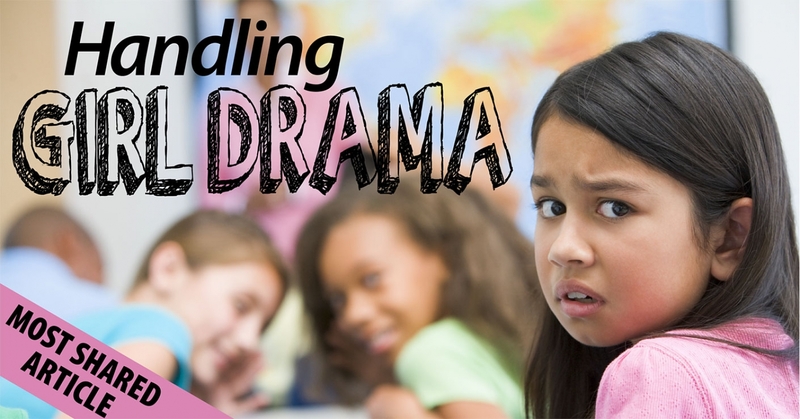 Start with a clear understanding of what’s expected in young friendships— and what crosses the line as a toxic relationship or full-out bullying. Girls spend most of their time together giggling until they can’t breathe, revealing secrets they wouldn’t share with anyone else and being absolutely themselves. Occasionally feelings get hurt, and jealousies and little annoyances arise, but the conflicts are quickly repaired. Friendships lessen as girls develop new interests, get assigned different classes or merely drift apart. In all of the above circumstances, a mother can heal her daughter’s friend-related wounds with a sympathetic ear and some microwave popcorn. If only everything were that easy! One friend talks behind the other’s back. Lies are told and confidences are betrayed. One friend is always in charge; the other is always the lackey. Feelings can’t be aired honestly for fear of reprisal. Conversations disintegrate into criticism and harsh teasing. One friend wants the other friend all to herself and may use the above tactics to ensure that dedication happens. Honesty, respect, support, sharing and trust go down the tubes. What then, Mom? Keep in mind that this is not the normal stuff everybody has to endure while growing up. Your daughter won’t just “get over it.” Did you? The potential to shade future friendships in dark hues is there. However, this is also your chance to help your daughter learn how to turn rocky relationships into smooth friendships— or to walk away with grace. Listen to your daughter’s woes all the way through, without interrupting her venting. She needs to release her frustrations. Empathize. A quick story about your own experience with infuriating friends can be validating. Encourage your daughter to be honest with her friends, such as by expressing her feelings without fear. Role play with her so she can experience this honesty firsthand. Paint a picture of good friendships. While offering your description, explain that if one friendship falls apart, there will be other friends to count on. Don’t tell your daughter exactly what to do. Help her figure out a solution. Don’t call other moms or insist that the teacher fix the friendship flub. Don’t make escaping the friendship be your daughter’s first line of defense. Yet, don’t tell her she’s a quitter if after a good try at reconciliation your daughter decides she’s done with the friendship. And if the following behaviors occur, all bets are off. When a girl seems to have made a career out of reducing your daughter to tears. When your daughter is threatened verbally, physically or emotionally. When someone isolates your daughter from her former friends. When your daughter’s schoolwork, health or sense of well-being are deeply disturbed. Get as much information from your daughter as you can, asking her to be honest and thorough. Be sure your daughter knows not to express her hurt feelings to a bully as she should do to her friends. Once bullying starts, even by an ex-best friend, the bully has to be treated as the mean girl she has become. If the above tips fail, do what you have to do as the parent to stop the problematic behavior. Ask for a parent-teacher conference. Talk to Mean Girl’s parents. You’re not intervening in a friendship— you’re protecting your daughter from damaging behavior. When in doubt, simply be your daughter’s ally. As she’s learning that even best friends can be unreliable, you may represent the one person your daughter can always count on.